How to Convert Audible Audiobooks to MP3 on Mac? "Recently, my cousin has been working on a homework to get a MP3 recording of his own to take part in a school activity. However, he din’t know anything that could record MP3 audio for him. I have searched online to help him and found some suggestion on MP3 recorder online tools. I just don’t know which online MP3 recorder site to use and how to record MP3 online with these MP3 recorder online. Please help." Actually, it’s very easy to record MP3 online with some MP3 recorder online sites, though the recording quality of these online MP3 recorder sites might not be quite satisfied. In this guide, you will learn how to record MP3 online with one of the most popular online MP3 recorder sites. There are a lot of online MP3 recorder software sites for you to choose for recording MP3 online. All of these free online MP3 recorder sites are easy to use and operate. http://recordmp3online.com/ is one of these online MP3 recorders. Step 1: Go to the website http://recordmp3online.com/. 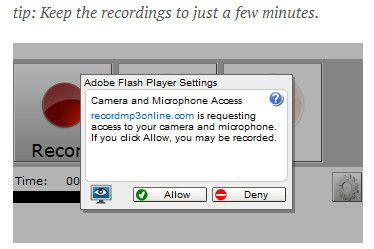 You will see that this online MP3 recorder asks you to do "Camera and Microphone Access" settings before you start to record MP3 online. Click the "Allow" button. 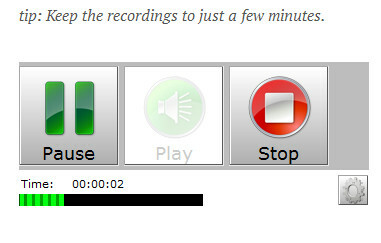 Step 2: You then could see the interface of this MP3 recorder online tool. There are 3 icons: Record, Play and Stop. Before clicking "Record" button, click the wheel icon to finish recording settings including: Audio Gain, Silience Level, Echo and Loopback, etc. Step 3: After settings, clickthe "Record" button to start recording. Of course, after clicking the "Record" button, you need to play back MP3 audio files. You could Pause or Stop recording anytime you like. Step 4: Save recorded MP3 audio. Click the "Stop" button to finish recording. This online MP3 recorder would automatically convert your recording to MP3 format for you to either download or upload to Dropbox. You could then change the filename on the popup panel, and click the Play button to play back recording. If you click "Download" button, there woul pop up a window to let you set a saving path. If you choose "Save to Dropbox", you will be asked to login on the popup window. It will be done when you finish saving recorded audio file in MP3. 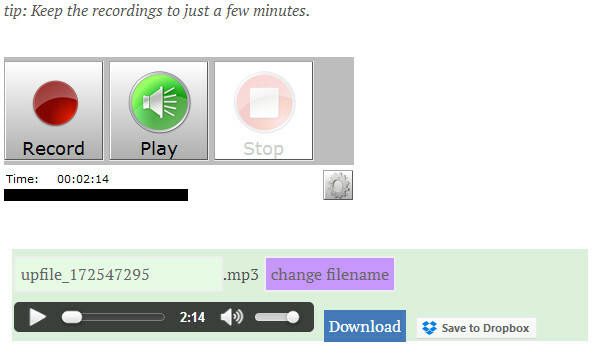 You could now start another MP3 audio recording online with this free online MP3 recorder site. Actually, it will be not convenient if you want to record online MP3 audio with online MP3 recorder sites. You might come across some problems like web interfering, interenet connection error, etc. 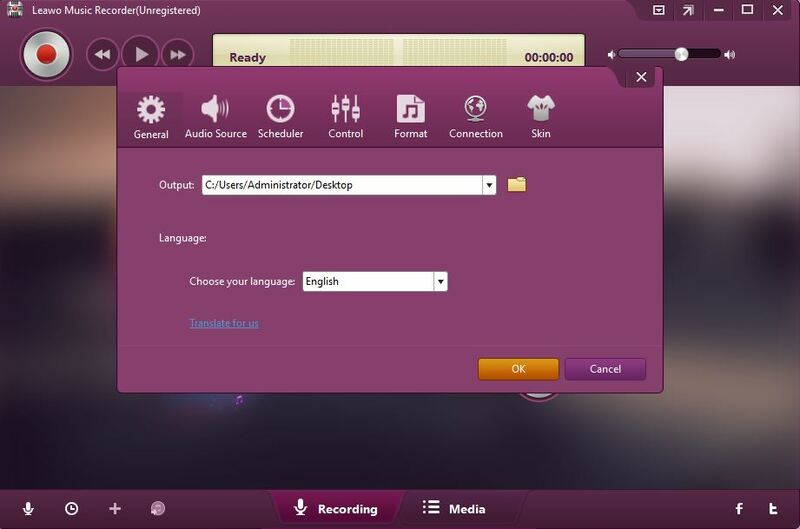 You are suggested to take use of online MP3 recorder alternative – Leawo Music Recorder, a professional MP3 audio recording software app that could record any MP3 audio from any audio source, be it online audio, computer audio or built in input audio, and record any audio for saving in either MP3 or WAV format. ☉ Record any music file from computer stream audio and built-in input audio. Why use Leawo Music Recorder as Online MP3 Recorder Alternative? Record any audio from computer audio and online streaming audio like YouTube, Facebook, AOL Music, Last.fm, etc. Built in recording Task Scheduler to preset recording Start Time and Recording Duration for off-hand recording. Various preset time filter to split recording upon personal needs. Record and save any audio into either MP3 or WAV audio format. Automatially download and add music tags for song recording. Support manually edit music tags after recording. How to Record MP3 Audio with Leawo Music Recorder? Directly click the above Download icons to download this MP3 recorder software app on your computer according to the computer system you’ve got. Click the mic icon on the bottom left. Between "Record Computer Audio" and "Record Audio Input" options, choose the one that meets your situation. 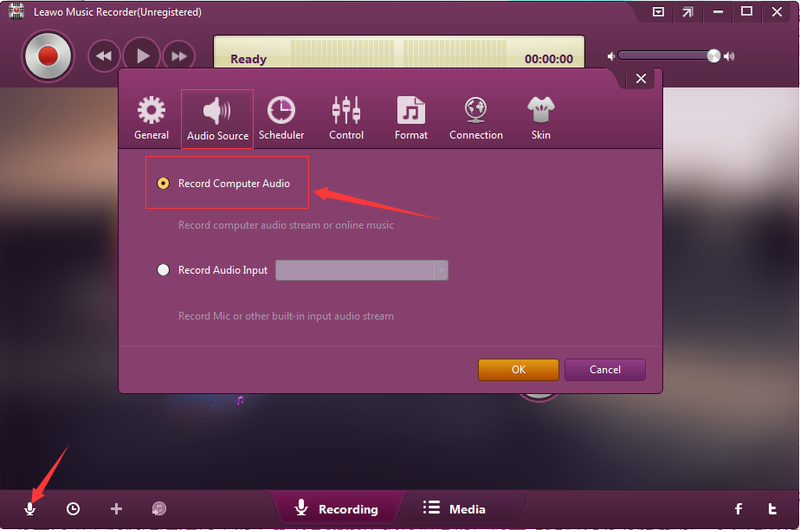 To record external MP3 audio of your computer, choose the "Record Audio Input" and select corresponding microphone. 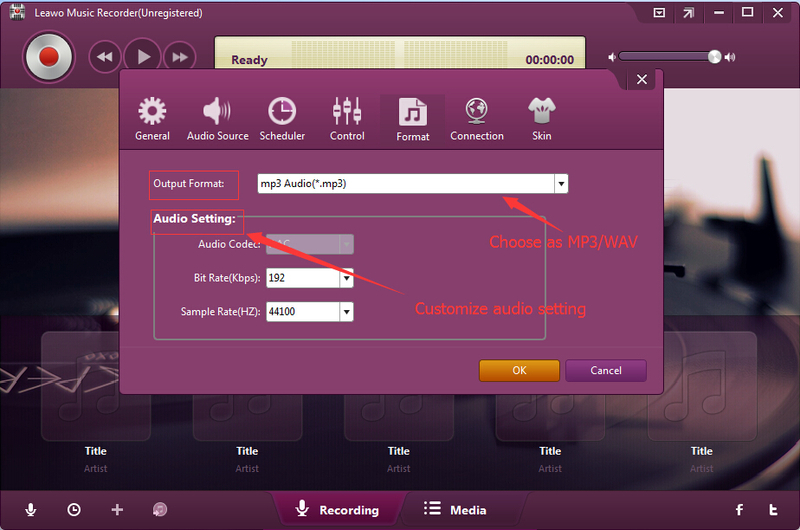 To record online MP3 audio or computer MP3 audio, choose "Record Computer Audio" option. Set output directory to save recorded audio files in the "Output" box on the "General" tab. You could set program UI language as well. 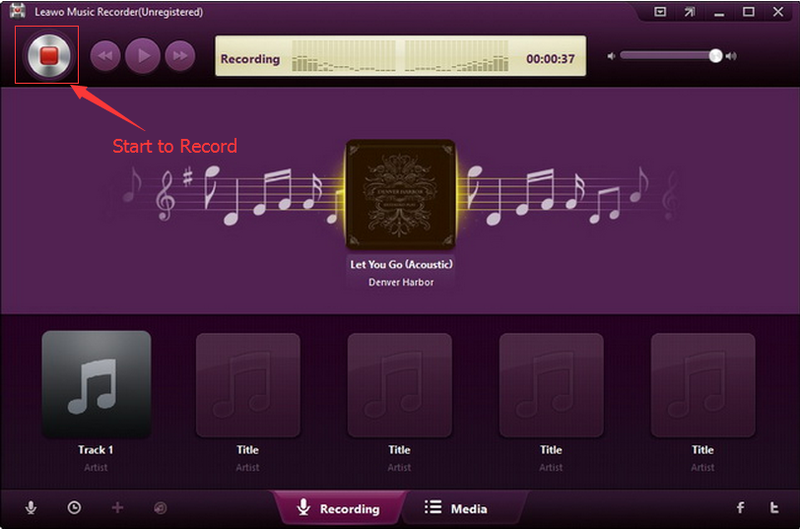 Leawo Music Recorder provides 2 audio formats as output format: MP3 and WAV. You could select either under the "Format" tab. What’s more, you could even change the bit rate and sample rate if you need. 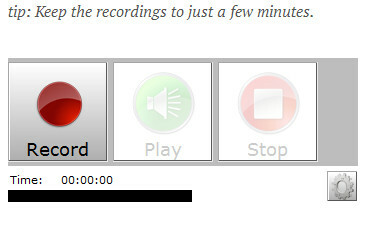 Click the red button on the top left of the main panel to start recording and then open your MP3 audio file for playback. Stop recording by click the red square button anytime you like. 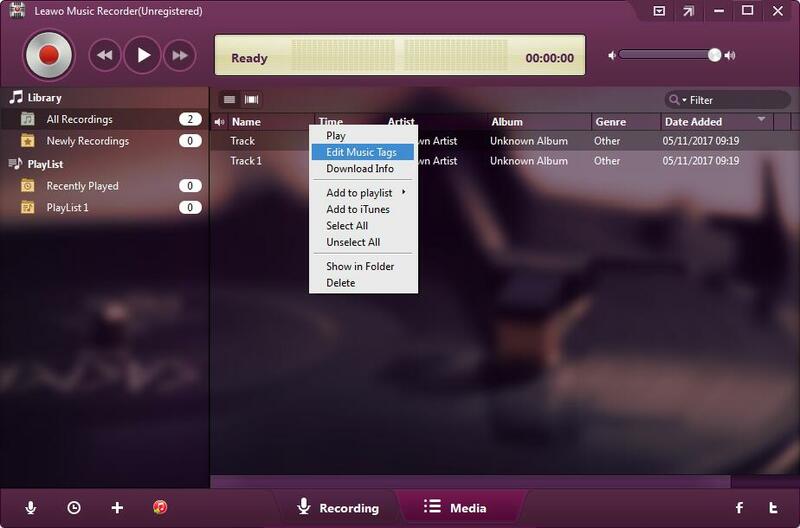 Leawo Music Recorder will add tags automatically if your recorded MP3 files are songs. You can also add sound tags manually. Find your recorded MP3 files in the "Library" under the "Media" panel. Right click your recorded MP3 audio file and then choose "Edit Music Tags" option to edit music tags like title, artist, album, cover, year, genre, etc. It’s all done with Leawo Music Recorder to record MP3 audio files. You don’t even need to connect to the Interent for recording MP3 online. What’s more, this free online MP3 recorder alternative supports one-click operation to apply recorded MP3 audio files to iTunes music library.